Now, several years later, after some years with Flash/Flex, I’m finally here using Haxe and NME. There’s now a working solution that runs under Html5, Flash and Windows — all with the same codebase — thanks to the fantastic Haxe NME project. I’m not ready yet, but the fundamentals are there. 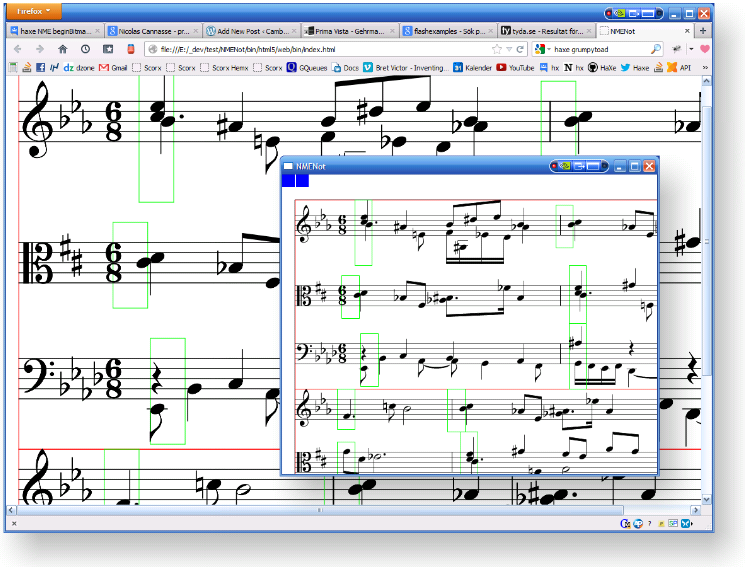 I can now produce music examples with what could be called professional level layout for both screen and print resolutions. And seeing the same codebase running on several platforms, both in the browser and on the desktop is really amazing! So, here I will try to describe what the goals are, what I’ve achieved this far, some about describing the challenges in transforming the exclusive esthetically demanding hand-craft-art called “music engraving” to objects, bezieer calculations, embeddable svgs etc. And also about the programming decisions, problems solved and unsolved etc. Professional looking traditional music notation – no crappy mousedrawn clefs! Formatting algorithms (object “anti-collision”, “allotment”, “aligning” and “justifying”) sophisticated enough to deal with the many tricky levels present in traditional notation and flexible enough to be used also for lyrics, dynamics and other more specialized notation elements. Multi platform thanks to Haxe NME for use on web (html5 and flash), desktop (starting with windows) and maybe mobile. Screen resolution and well as print resolution output. A replacement for Sibelius, Finale or some of the other professional commercial music notation solutions able to deal with 50 page orchestral scores. Not a chance! In the next part I will try to present some of the interesting challenges that comes with computerized music notation, and how I try to tackle them.